A sunburn isn't just a painful nuisance — it can wreak havoc on healthy skin and put you at risk for getting skin cancer later in life. (In fact, two or more severe sunburns before age 18 greatly increase the chances, as skin has a sort of a "memory" of burns and tans year after year. While the best treatment is prevention with an effective sunblock, sunscreen, or a proper physical barrier from the sun, things can sometimes go wrong. So what do you do when you return home from an outing and you resemble a well-done lobster bake? Try one of these time-tested home remedies…and give yourself a chance to heal. Paul Michael was the first to introduce me to this cure, in his 254 Uses for Vinegar piece. Apply vinegar (or a half-water, half-vinegar solution) with a spray bottle or dab on with a towel. Then cover the area with a tea towel for overnight relief. While a bit stinky, it does wonders to "cool" down the burn. A variation on this is to add it to Maalox (the tummy stuff) instead of water and brush it on with a basting brush or a cotton ball. Since aspirin alone can cause burns, be certain you don't have an intolerance to it being applied topically, and don't let it sit on your skin any longer than overnight. Whip up a batch of tea (either from boiled tea bags or sun tea), and cool it in the fridge along with some ice. Spray directly on burned skin or dab with a soft rag. It instantly cools and relieves the burn, so keep applying for best results! Apply gauze dipped in lukewarm milk to the burned area. Leave on for minimum of 20 minutes, and rinse the area when it starts to get a bit funky-smelling (or no more than an hour or so later). Growing up, we always had an aloe plant in the home for minor burns and afflictions. Break off a piece of the plant and squeeze it so that some of the goo (gel) drips out the end. 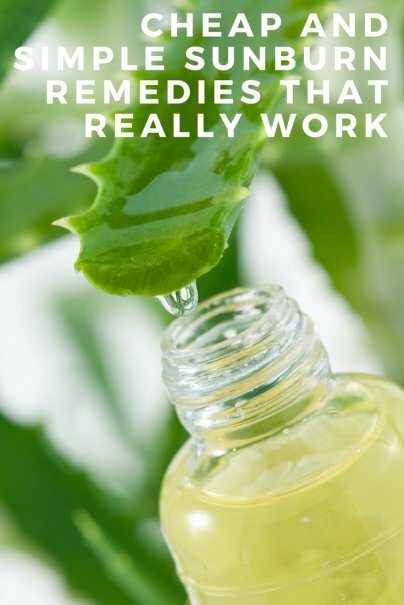 You can rub this directly into the sunburn for the same kind of soothing relief you can get from those "after-burn" gels and over-the-counter commercial products (only better). When the gel starts to dry, the area may become stiff, so keep applying or cleanse the area and apply with some new gel. Medicated soaps, perfumes, and Retin-A can also make you susceptible to overexposure. And so very timely as I type with a red face and sun-burned scalp. I pressure washed our patio yesterday and got more sun than I thought I was getting. Funny how it sneaks up on you. Thanks for sharing the list of home remedies. As painful as it sounds, taking a hot shower to get the sting out of sunburns. I also like using Noxema as a way to cool off the burn. Best of luck - I hate sunburns! My mom used to use Noxema for sun burns. I think it helps. I also have a sun burn gel with lidocaine and aloe vera that I keep in the fridge in case of sunburns..
Shaving cream lotion works for me. I used it several times last year and it worked wonders. I used the men's noxzema shaving cream (red can) and it worked wonders. Prevent them -- that is my best solution. Why do that to your skin??? yeah, cause so many of us TRY to get sunburnt! Why do that to my skin? Like a person would do that on purpose...I was outside for 2 hours with a 65 sunblock on and burnt to a crisp...sometimes things happen that you don't plan maybe if you have nothing helpfl to say you shouldn't say anything at all! I agree that this is the best solution. But despite our best intentions, things do happen. I never get more than a minor sunburn once every few years, but it's good to know that there are ways to take the "ouch" out! Thanks for all the really great tips! I can vouch for the aloe -- it's good for all kinds of burns. I used it to help lessen radiation burns (during radiation therapy for breast cancer). It really works! It kept my radiation burns down to a bad sunburn instead of blisters. I feel your pain--fair Danish skin and all. you mean to stay hydrated i think. i've always heard that being well hydrated before going tanning helps your skin prevent burning as well. Don't know if there's any truth to it, but i'm a big fan of the wonders of proper water intake, so i guess it can't hurt! Trust me, as I sit here every day nervously awaiting the results of my biopsy, I could kick myself for every time I went out in the sun without sunscreen, and just laid outside and baked, saying, "well, it'll turn into a tan in a few days." It hardly seems worth it now. Slater on the sunscreen, wear a hat or tightly knit cotton clothing, and stay in the shade to prevent burns and anything more serious! It's essential if you're going to be outside for more than about 2 hours. I recently tailgated at a Nascar race, and did this every two hours or so. I ended up getting home with barely a tan. Also if you're swimming--doesn't matter if it says waterproof or not. This site is not for not getting sunburn. Hell if I didnt get sunburned I would not be looking on here so prevention is not the key for anyone looking on here. Everyone knows to stay out of the sun and to put proper sun care products on but once in a while we make mistakes. Lets not worry about our past mistakes and just figure out how to make the pain go away!!! work just as well for sunburn when you just swallow them. I do a lot of yard work and don't always remember the sunscreen. Plus I'm achey as all get-out after my weekly mowing and weeding, so aspirin is my wonder drug. I pop three when I'm done with my coffee and no more pain. one thing that worked well for me was shea butter. You can get them in tins in health food stores and it works for all kinds of burns and dry skin. Probably the same as milk. Go to a 99Cent store and get a tube of teething gel. It has the highest concentration of Lidocaine and rub that baby in. Cheap and effective way to get a prescription drug over the counter. With kids, you can't take enough precautions, but things happen. Thanks for the advice, we'll file it away under preventable but not. Zinc Oxide cream, usually for diaper rash, works very well to recover a bald head from a bad sunburn. Trust me. Zinc oxide, and even moreso titanium dioxide, are cheap and effective ways to prevent the sunburn in the first place. Unlike the organic (carbon-containing) UV absorbers, ZnO and TiO2 remain on the surface of your skin, don't react chemically with your skin, and completely block every kind of UV. Don't forget that you can also soothe a sunburn with oatmeal. An oatmeal bath is soothing for all sorts of skin conditions. As someone with a degree in chemistry and trained as a physician, I am truly amazed by how often homeopathic first-aid has worked on sunburns, even severe ones, reducing symptoms and signs. Topical more often than oral, admittedly, but still surprising. Oral is cheaper. Properly done there's no side effects. Instructions for such would take too long to put here, but such are in books and websites. My sunburn is so bad, I can't even put anything on it. Just the wind blowing outside hurts me. I have to sleep sitting slightly up. I've suffered from some really bad burns over the past years and found that soaking in a tub of warm/cool bath water with a bunch of tea bags helped so much. Depending on where the sunburn is you can soak in the tub or if just on face or shoulders you can make a big batch of hot tea and let it cool in fridge. Transfer the tea to a spray bottle and keep spraying! I beleive that the tea leaves help to soothe the burn and the pain that goes along with it! I have Scottish skin and I am on antibiotics and Retin-A cream right now. I stopped the cream like my doctor told me and bought SPF 70 and the brand she told me to. I reapplied liberally every 2-2 1/2 hours and I am still pretty burned. I am a big fan of prevention and always slather the sunscreen on but sometimes even the most careful people can still get burned. I have used aloe and tea bags before, I am going to try the vinegar tonight. SO I WENT TO THE LAKE THIS PAST WEEKEND AND WOW DID I GET BURNED! I AM EXTREMLY PALE NORMALLY AND NOW I LOOK LIKE A LOBSTER! I ALSO GOT HEAT STROKE AND WAS SICK ALL DAY SUNDAY AFTER GETTING BURNED SATURDAY. I JUST TRIED OUT THE VINEGAR ON ONE OF MY FOREARMS AND SO FAR SO GOOD! I AM GOING TO HAVE A BATH AND PLAN ON PUTTING SOME VINEGAR IN THE WATER. WISH ME LUCK!! My sunburn has sunburn! It hurts so bad! I have it on the shoulders. I sunscreen I used was swept by the waves of our local beach.... I think I am going to use a combination of these remedies..... I hope they work! Being a red-head and of European decent (mostly German but Irish, Dutch, Welsh, etc) I burn easily. I can be outside literally for 15 minutes and start turning pink. Even with sunscreen on that has a high SPF and blocks UVA and UVB I still burn. I generally apply 30 minutes before going into the sun and every hour to an hour and a half afterwards, whether I've been in water or not. I also wear floppy hats, shades and shirts and I still end up burning somewhere. This time...it was the top of my feet. The one place I forgot to apply sunscreen. Figures. Going to try the vinegar remedy tonight. just tried the vinegar on my sun burned lips. hurts much worse than doing nothing, i don't recommend it for very severe sunburns AT ALL. i'm still trying to get the pain to go away. Here's a real good one. I used a product that I got in Hawaii. It is called... get this... Maui Aui. It has Aloe, Caledula for the skin and white willow for the pain and st. john's wort for the itch. It's great through the hurting,itching pealing phases and I think it made me heal faster. It sure made things feel better. It wasn't very expensive, $8 or $9 if remember correctly and it was WELL worth it. There was no phone number on it but the company name says Nature's Rite. This stuff is like Natural Solarcaine. with aloe and skin regenerator. It's really cool. i just tried the apple cider vinegar....and then aloe vera cream... now itches.... bad is this normal?? Did it itch right away after you applied it? Or are you experiencing itching overall? Unless you're allergic to aloe (which is rare), I would imagine you are just having the normal "itches like Heck" phase that comes with a burn. Your dead skin is going to itch until it comes back new again. I live in FL and always have trouble with sunburn. Especially when my children go to a friend's house and do not use enough sunscreen. Thanks so much for the great info! This time, I applied the Pure Aloe Skin Treatment every evening after getting back to my hotel room. The first thing you notice is how immediately soothing it is. Also, my skin recovered more quickly the next day. I was done peeling within only a couple days after getting home, and had a great tan as well. I'm never going on vacation without this made from earth aloe again. i used suave rosemary mint hair conditioner. the mint cools it down and the conditioner helps resore you're skin from the sun damage. worked for me. It'll work temporarily if you dont have any of the things above....! the Noxzema face cleaning cream works wonders on sunburns!!!! it doesnt have the best smell but man does it soak in to hydrate your skin and relieve the pain. you can even see when it soaks into your skin cause the white of the face cream will disappear. Soaking a washcloth in tea and laying it on the sunburn seemed to help. Ill def do it again if I ever have a bad sunburn like I do now. I have a REALLy bad sunburn!! My friend and i went to the pool on Tuesday for about 5 hours and I didn't wear sunscreen. Yesterday it just hurt so bad I couldn't move, but today it blistered and started itching. It was SO BAD! I wanted to die. Me too . When did you get better .